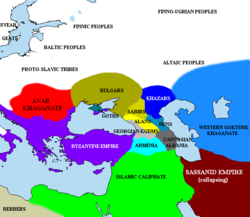 Upon the Hunnic defeat of the Goths on the Pontic Steppe around 375 AD, many of the Alans migrated westwards along with various Germanic tribes. They crossed the Rhine in 406��AD along with the Vandals and Suebi, settling in Orléans and Valence. Around 409 AD, they joined the Vandals and Suebi in the crossing of the Pyrenees into the Iberian Peninsula, settling in Lusitania and Carthaginensis. The Iberian Alans were soundly defeated by the Visigoths in 418 AD and subsequently surrendered their authority to the Hasdingi Vandals. 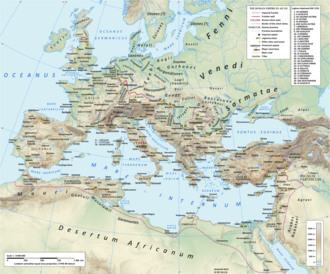 In 428 AD, the Vandals and Alans crossed the Strait of Gibraltar into North Africa, where they founded a powerful kingdom which lasted until its conquest by the Byzantine Emperor Justinian I in the 6th century AD. It is believed that some Alans resettled to the North (Barsils), merging with Volga Bulgars and Burtas, eventually transforming to Volga Tatars. [not specific enough to verify] It is supposed that the Iasi, a group of Alans founded a town in the northeast of Romania (about 1200–1300), near the Prut river, called Iași. 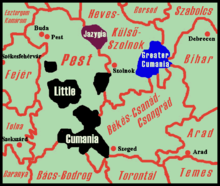 The latter became the capital of ancient Moldavia in the Middle Ages. Golden, Peter B. (2009). "Alāns". In Fleet, Kate; Krämer, Gudrun; Matringe, Denis; Nawas, John; Rowson, Everett. Encyclopaedia of Islam, THREE. Brill Online. ISSN 1873-9830. Zadneprovskiy, Y. A. (1 January 1994). "The Nomads of Northern Central Asia After The Invasion of Alexander". In Harmatta, János. History of Civilizations of Central Asia: The Development of Sedentary and Nomadic Civilizations, 700 B. C. to A. D. 250. UNESCO. pp. 457–472. ISBN 978-9231028465. Retrieved 29 May 2015.